Kingsman star Taron Egerton takes aim in the first official photos the new Robin Hood origins movie. The story of Robin Hood has been told for centuries and the new version is going to have to go a long way in making this movie stand out from the countless others that we've seen over the years. 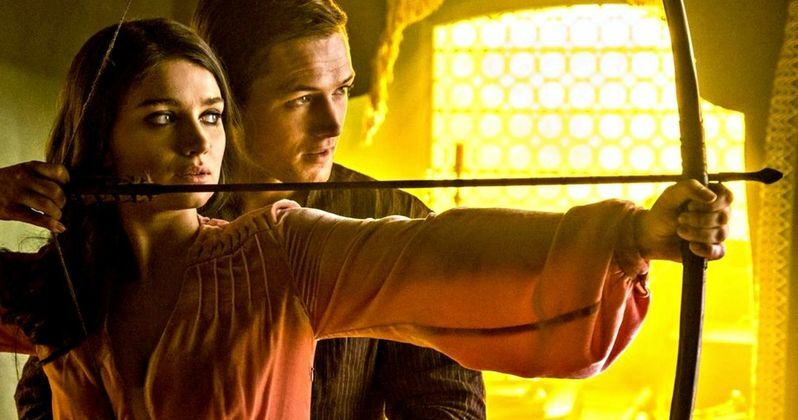 According to Robin Hood director Otto Bathurst, part of that fresh take will involve focusing on Robin Hood as a revolutionary, and not just a thief that has been shown many, many times over the last 800 years. Entertainment Weekly has provided the first look at the set from the upcoming Robin Hood and it looks like, well, Robin Hood. Taron Egerton is Robin Hood, Jaime Foxx is Little John, Jamie Dornan is Will Scarlett, Eve Hewson is Maid Marian, and Ben Mendelsohn is once again playing a villain, but this time as the Sheriff of Nottingham. The new pictures don't reveal much about the upcoming movie, but a brief interview with director Otto Bathurst sheds some light on how his take on Robin Hood will set it apart from the others. Otto Bathurst revealed that this story will not be about Robin Hood stealing money from the rich to give to the poor at all. "You don't become a legend for 800 years if you've just stolen a few bags of money from rich people to give to the poor. In my mind, Robin Hood was this sort of seriously militarized anarchist revolutionary, a freedom thinker and a truth seeker. And the more I got into the story, it just became startling how utterly relevant it is to what's going on in society now." It does sound like a fresh take and the perfect story to be told at this time. Robin Hood may go down as one of the best versions of the story that has been told in recent times. As it turns out, Taron Egerton was apprehensive about taking on the role. Taron Egerton told Entertainment Weekly that he was wary of taking on the part until Otto Bathurst revealed what he had in mind. And as Egerton echoes, this is going to be a completely fresh take on the myth of Robin Hood. This might be the bloodiest take on the character that has ever been attempted. You don't normally hear The Hurt Locker mentioned when talking about Robin Hood. Egerton explains. "I was approached not long after the first Kingsman movie had come out, and my initial response, to be totally honest, was 'Why?' (But) Otto told me he wanted to do something entirely revisionist, something that can't be tied down to a medieval universe. The first act of the movie, these scenes crusading in Syria, were written like something from The Hurt Locker. It was fantastic, and that was enough to convince me." Many fans only think of Robin Hood as the child's story from either the Disney animated version or Kevin Costner's portrayal in the early 1990s or even Mel Brooks' Robin Hood: Men in Tights, so it may take some convincing to get moviegoers in the seats. But if anyone can do it, it's Otto Bathurst and Taron Egerton along with the rest of the stellar cast. You can check out the first photos from the set of Robin Hood below, courtesy of Daily Taron News' Twitter account.